Good place to stay, the staff is nice, the bed is confortable and the bar is friendly ! Gorgeous one night stay in this hotel, perfect location bang in the middle of Arles. Couldn’t fault anything, staff were charming especially the concierge on duty who parked the car. Would definitely return and no hesitation in recommending. Our room was upgraded and delightful. Great location. Did not get to try the restaurant because we were there on a Monday and it was closed. But Tuesday breakfast was very good. Hotel and staff very good, restaurant not so good. Apart from the eye straining tiles in the bathroom, the room was good, though CNN on the TV would have been welcome. I don't think much of the &quot;styles&quot; in Accor hotels. The bed was good, the staff pleasant and helpful.. I really enjoyed my five night stay. The location is central, with easy parking (except on Saturday, when the incredible market is out front). The staff was friendly and very helpful with events and sites to see. The restaurant, bar/lounge area are very nice, and so is the spa. I plan to stay again during my next trip to Arles. Extremely nice and helping staff, fun furnishing, much pleasing little details, all added to make our short stay extremely pleasing. Kind hospitality from the staff. They took care of us. The bedroom was extremely quiet and well furnished. The breakfast was good too. Sets high expectations, but fails to deliver. We came for a short break, spending all of my accord points to enjoy a bit of luxury. The first impression, in spite of lovely and professional staff, is disappointment to learn that the small spa is not included in the price and the pool closed. Unlike other accord 4-5 stars and all other hotels of similar standing, at the Jules Cesear clients pay extra for the last star. Sell the hotel as a five star means including 5 star service in the price. Next Christian Lacroix décor-the entrance employs innovative use of carpet that looks like local tiles. Otherwise the use of color and motif clash, rather than compliment the old building. The bar is a technicolor dessert-not surprising that we never saw anyone having a drink. Forget Lacroix-get a young local designer to make a place fit for humans. The dining room and breakfast rooms are great. We had an upgraded room. It smelt musty, was too hot and the windows are small, so even after turning off the heating and opening the windows it was difficult to cool the room. It is a simple (cheaper) air conditioning system, which is either on heating, or on cooling: once the hotel switches to winter mode, clients can no longer obtain a low temperature by selecting one-it doesn’t work. We did appreciate the bell boy service: he explained everything that we needed to know about the hotel and the room. Your staff are saving you. Coat hangers in the wall in the room would have been useful. The bedside lamps make a lovely light (thanks Mr Lacroix) but are useless as reading lamps and we both knocked our heads in them. The bedside tables are too small for practical use. The bathrooms are great. The breakfast is nice. What about freshly squeezed orange juice?- even Ibis styles offer that! In brief: check out the Pullman at Roissy en France, price, services included, quality of breakfast, rooms, air conditioning system-this should be your benchmark. The JC is farting higher than its arse and relying on staff and hype, but décernent clients won’t put up with it. We stayed for just one night at the end of a road trip around the Pyrenees and Occitanie. 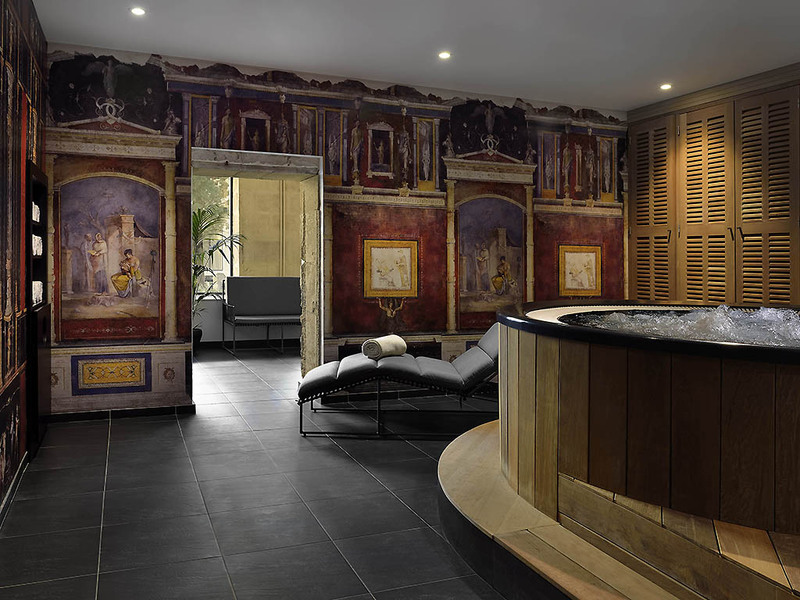 We loved the spa and funky décor of this impressive Lacroix designed hotel. Voiturier and reception team especially helpful ! The room (suite?) was ok, but not very enchanting and in our opinion highly overpriced for what it was. Beds were comfortable though, air conditioning worked well and silently. Very friendly staff at the reception and competent and friendly valet service. The service in the Lou Marques restaurant was unacceptable. After an hour wait my wife was served the wrong dish. When we pointed this out the waiter ripped both our plates away, without comment. After another 15 minutes wait the correct food was served. Although no apologies were offered presumably the free refill of our wine glasses was kind of an apology. At breakfast the two staff ladies were very friendly, worked very hard, but were highly overstretched. Difficult to get a pot of coffee. The breakfast buffet was constantly out of something, cheese, then scrambled eggs, and it was especially difficult to get another bottle of still water. When a bottle finally arrived the water was gone in no time due to the demand. What was wrong with bringing two or three bottles at the same time? Not the staff's fault, the ladies nearly ran through the breakfast area to serve the guests. It appeared to us to be a management problem not organising enough buffet food for the number of guests. Again, the staff was exceptionally courteous and helpful, but for these prices we would not recommend this hotel and especially not the restaurant. Good location. Smoke in room. The room smelled smoky. The bellman was helpful. The location was awesome. The toilet was square! Great Hotel - great location ! Really enjoyed our stay at this beautiful hotel. Staff particularly lovely.